Parents with kids of ages 0-5 were asked whether they started reading aloud to their children before thye were 3 months old, and 1 year old. 35% of parents said they started reading to their child before they were 3 months old, and 70% said they started reading to their child before they were 1 year old. 65% of parents with kids of ages 3-5 say that they read aloud to their child 5-7 days a week. The frequency with which parents read to their children decreases with age, and drops off dramatically after ages 5 and 8. 41% of parents with kids ages 6-8 read alout to tehm 5-7 days a week, and 16% of parents of kids ages 9-11 read aloud to them 5-7 days a week. Despite this, 58% of children from ages 6-8 expressed that they wanted their parents to continue to read aloud to them. 61% of parents of children ages 0-5 claimed to read aloud to their kids at least weekly, and also read more than one book each time. 73% of kids who are read aloud to at least weekly pick their own books for the occasion. 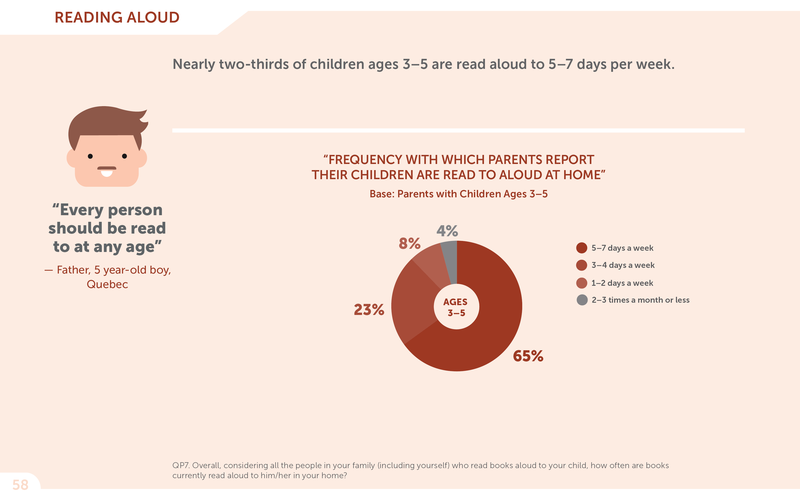 Both parents and children alike expressed great fondness towards reading aloud, with 87% of kids ages 6-11, and 86% of their parents saying that they liked or loved read-aloud time. 90% of parents of children ages 0-5 also said that they liked or loved reading aloud time. 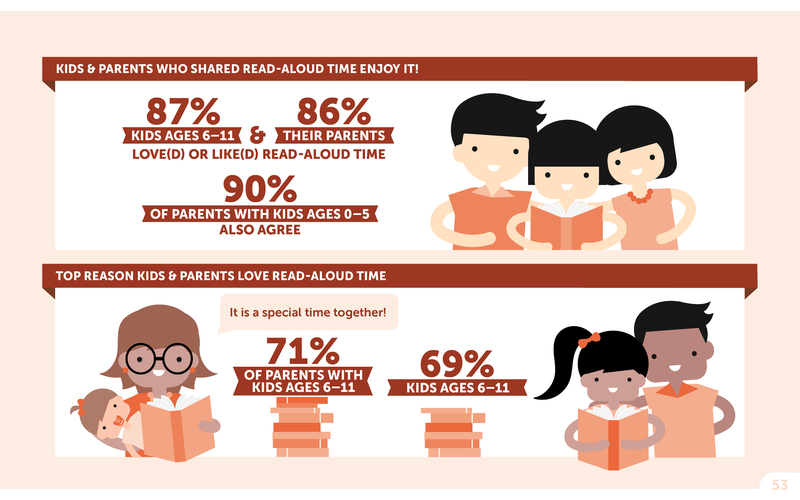 69% of kids ages 6-11 and 71% of their parents agree that the top reason that they love read aloud time is because it is a special time together. 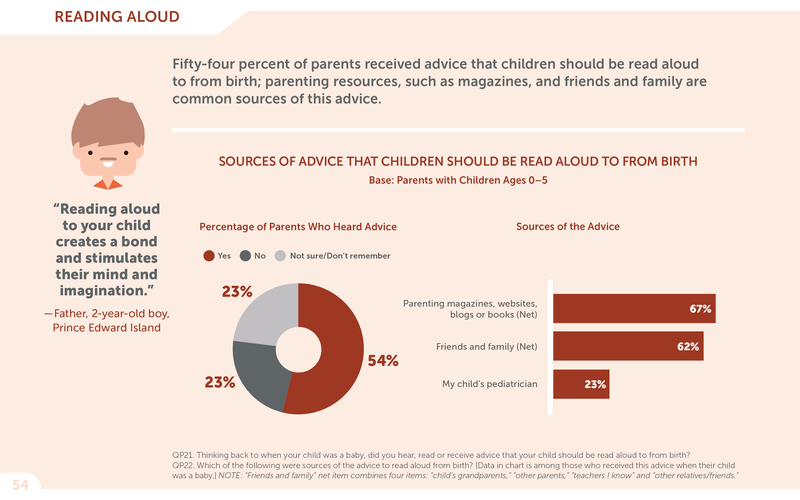 Fifty-four percent of parents received advice that children should be read aloud to from birth; parenting resources, such as magazines, and friends and family are common sources of this advice. Parents of children from ages 0-5 were asked whether or not, when their child was a baby, they were advised to read to them aloud from birth. 54% of parents reported that they had heard this advice, 23% said that thye had not, and another 23% was not sure, or didn't remember whether they had or not. Of the parents who remembered hearing this advice, 67% said they heard it from parenting magazines, webistes, blogs or books, 62% said they heard it from friends and family, and 23% said they heard it from their child's pediatrician. Open ended response from a Father of a 2 year old boy from Prince Edward Island about why reading aloud is important: "Reading aloud to your child creates a bond and stimulates their mind and imagination." Only 35% of parents started reading to their children before 3 months of age. Parents of children of ages 0-5 were asked to think back to when the first time their child began to have books read aloud to them at home by them or another family member. 35% said their child was less than 3 months old. 22% said their child was 6 months to just under a year old. 6% said their child was 1-2 years old. 22% said their child was 2 years or older. 2% said their child is/was not read to. In all, 70% of parents reported that their child was read aloud to at some point before they reached 1 year old. An open ended response from a Grandmother of a 1 year old boy from Quebec about reading aloud: "He's only 1, but he gets really happy when you show him a book. He smiles and starts to pay attention." 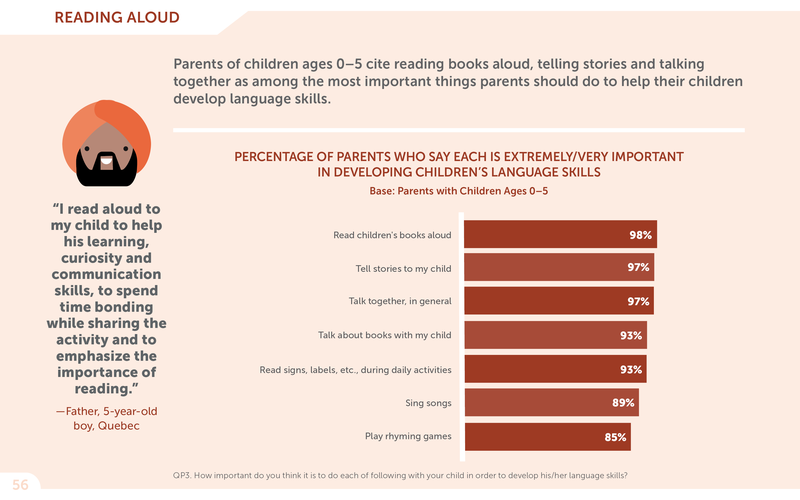 Parents of children ages 0-5 cite reading books aloud, telling stories, and talking together as among the most important things parents should do to help their children develop language skills. Parents of children ages 0-5 were asked whether they thought a series of verbal activities were important for developing their child's language skills. 98% agreed that reading children's books aloud is important for this. 97% agreed that telling stories is important for this. 97% agreed that talking together in general is imporant for this. 93% agreed that talking about books with their children is important for this. 93% agreed that reading signs, labels, etc. during daily activities is important for this. 89% agreed that singing songs is important for this. 85% agreed that playing rhyming games is important for this. An open ended response from a Father of a 5 year old boy from Quebec on the importance of reading aloud: "I read aloud to my child to help his learning, curiosity and communication skills, to spend time bonding while sharing the activity and to emphasize the importance of reading." More than half of children ages 0-2 are read aloud to 5-7 days a week. A base of parents of children ages 0-2 were asked how often their child was read aloud to by them, or any other family members, at home. 56% of parents said their child is read to 5-7 days a week. 25% of parensts said their child is read to 3-4 days a week. 12% of parents said their child is read to 1-2 days a week. 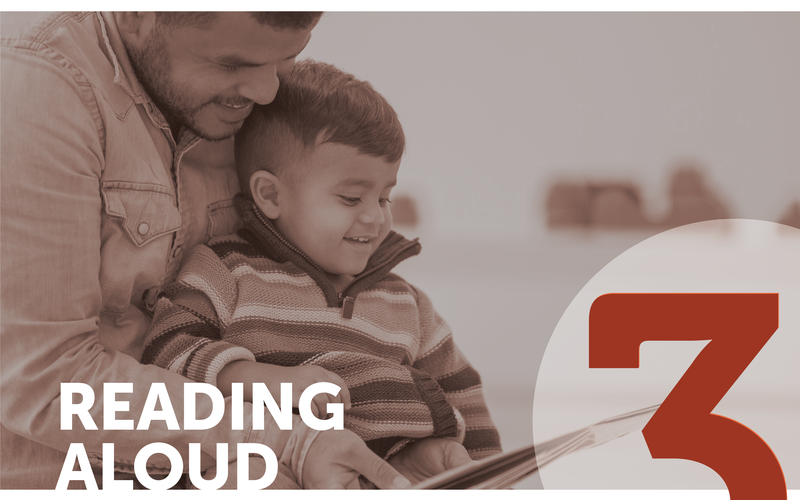 7% of parents said their child is read to 2-3 times a month or less. "Ca nous permet de passer du temps en famille rire et de suivre ensemble la meme histoire. "- Pere, fille de 2 ans, Quebec. An open ended response from a Father of a 2 year old girl from Quebec about the importance of reading aloud: "Reading as a family allows us to spend time together, laugh and follow the same story." Nearly two-thirds of children ages 3-5 are read aloud to 5-7 days per week. A base of parents of children ages 3-5 were asked how often their child was read aloud to by them, or any other family members, at home. 65% of parents said their child is read to 5-7 days a week. 23% of parensts said their child is read to 3-4 days a week. 8% of parents said their child is read to 1-2 days a week. 4% of parents said their child is read to 2-3 times a month or less. 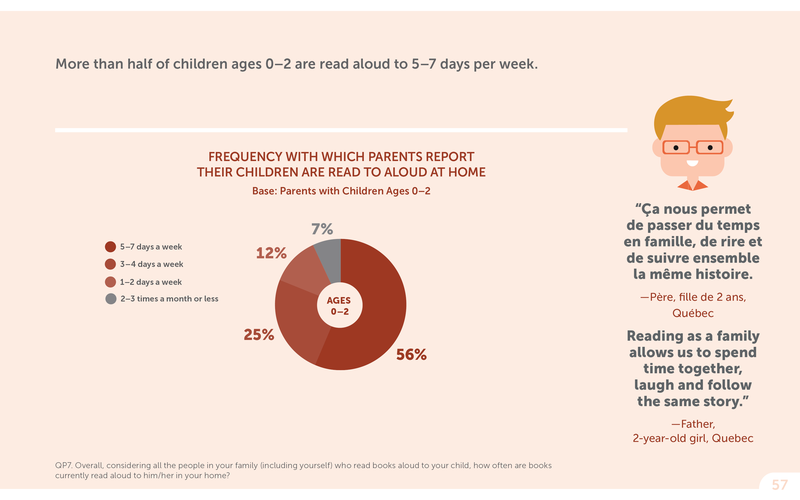 An open ended response from a Father of a 5 year old boy from Quebec on the importance of reading aloud: "Every person should be read to at any age"
While many parents of children ages 0-5 read to their child 5-7 days a week, the frequency of reading aloud drops significantly after age 5, and again after age 8. A base of parents of children ages 0-11 were asked how often their child was read aloud to by them, or any other family members, at home. 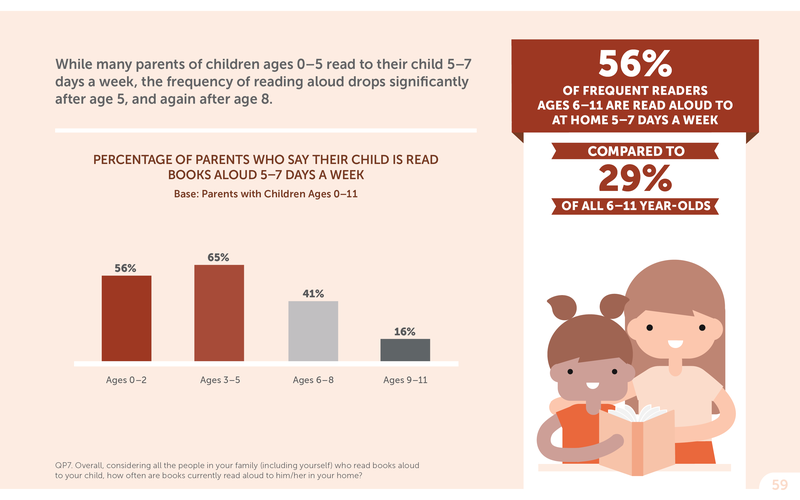 56% of parents of kids ages 0-2 say their child is read books aloud 5-7 days a week. 65% of parents of kids ages 3-5 say their child is read books aloud 5-7 days a week. 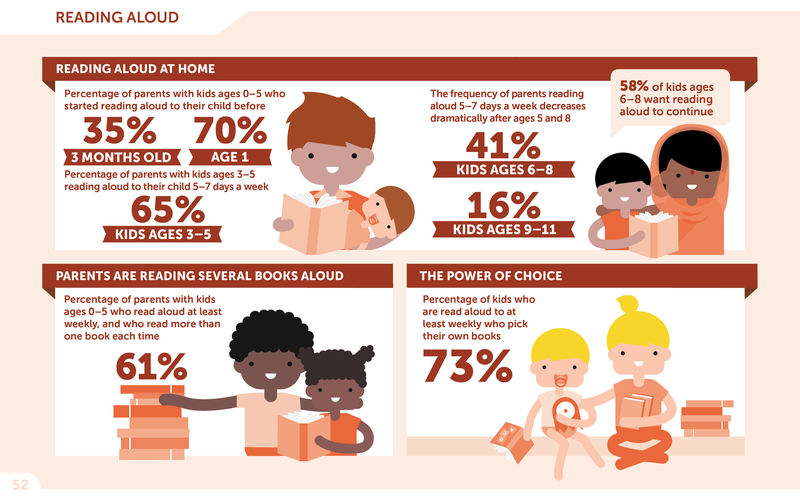 41% of parents of kids ages 6-8 say their child is read books aloud 5-7 days a week. 16% of parents of kids ages 9-11 say their child is read books aloud 5-7 days a week. 56% of all frequent readers ages 6-11 are read aloud to at home 5-7 days a week, compared to only 29% of all 6-11 year olds. Three in five (61%) parents with kids ages 0-5 read more than one book each time they read aloud to their child. A base of parents of children ages 0-5 were asked how many books they would typically read to their child at one time. Of all parents asked, 25% said they would typically read 3+ books, 36% said they would typically read 2 books, and 39% said they would typically read 1 book. 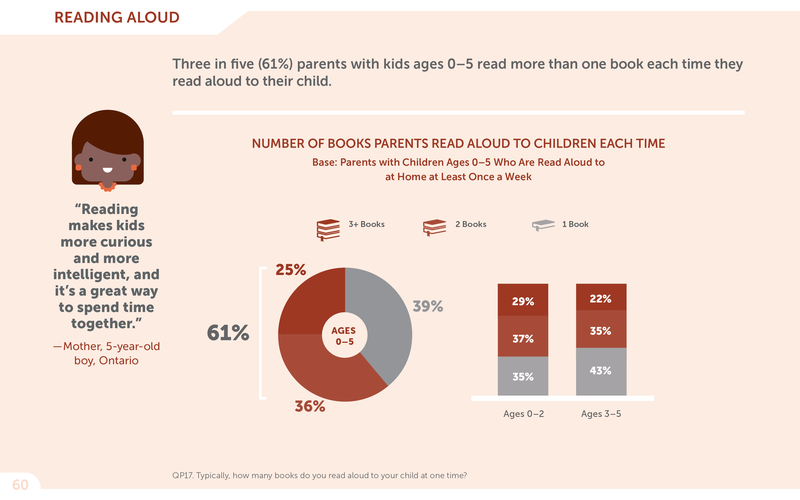 A total of 61% of parents, therefore, typically read multiple books when reading aloud to their kids. For parents of children ages 0-2, 29% said they would typically read 3+ books, 37% said they would typically read 2 books, and 35% said they would typically read 1 book. For parents of children ages 3-5, 22% said they would typically read 3+ books, 35% said they would typically read 2 books, and 43% said they would typically read 1 book. 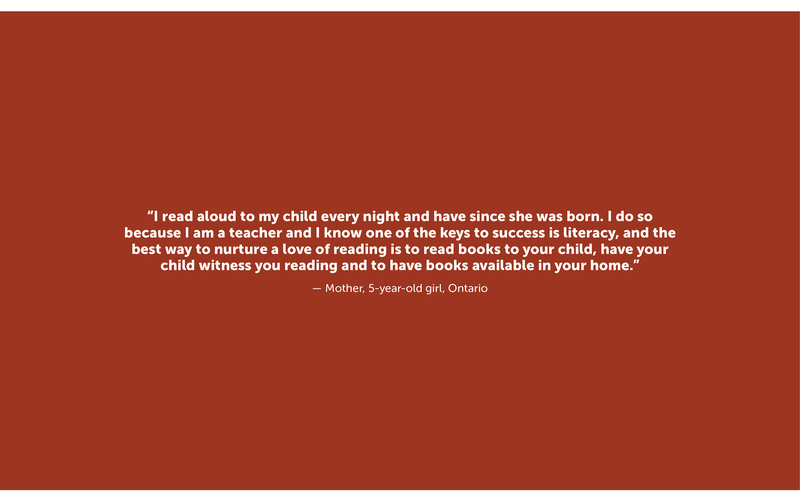 An open ended response from a Mother of a 5 year old boy from Ontario about the importance of reading aloud: "Reading makes kids more curious and more intelligent, and it's a great way to spend time together." Book choice starts early, with six in ten kids under age 2 choosing their own books at least most of the time. A base of parents of kids from ages 0-5 who read aloud to their child at home at least once a week were asked how often their child personally picks out the book that they read to them. Of all the parents asked, 27% said their child picks every time, 47% said most of the time, 17% said some of the time, and 9% said rarely/never, meaning that in 73% of cases, the child often or always will pick out the book. For parents of kids ages 0-2, 23% said their child picks every time, 40% said most of the time, 19% said some of the time, and 19% said rarely/never, meaning that in 62% of cases, the child often or always will pick out the book. 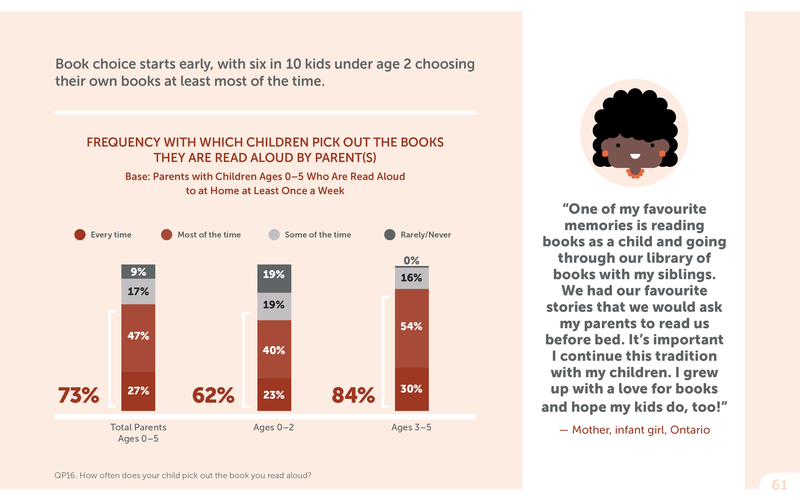 For parents of kids ages 3-5, 30% said their child picks every time, 54% said most of the time, 16% said some of the time, and 0% said rarely/never, meaning that in 84% of cases, the child often or always will pick out the book. An open ended question from a Mother of an infant girl from Ontario on the importance of reading for fun "One of my favourite memories is reading books as a child and going through our library of books with my siblings. We had our favourite stories that we would ask my parents to read us before bed. It's important I continue this tradition with my children. I grew up with a love for books and hope my kids do to!" Younger Children and boys are more likely to say they wanted reading aloud to continue. 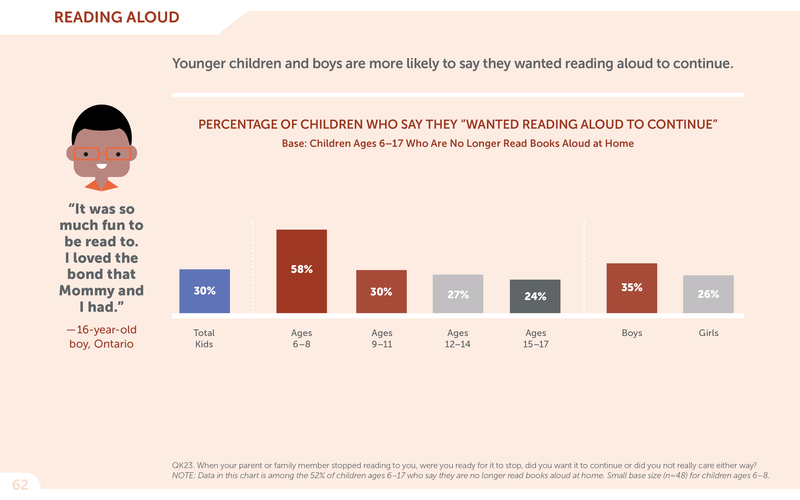 A base of children of ages 6-17 who are no longer read books aloud at home were asked if, when they stopped being read to aloud at home, they were ready for it to stop, or wanted it to continue. Of all the children asked, a total of 30% said that they wanted reading aloud to continue. For children of ages 6-8 asked, a total of 58% said that they wanted reading aloud to continue. For children of ages 9-11 asked, a total of 30% said that they wanted reading aloud to continue. For children of ages 12-14 asked, a total of 27% said that they wanted reading aloud to continue. For children of ages 15-17 asked, a total of 24% said that they wanted reading aloud to continue. For boys of all ages asked, a total of 35% said that they wanted reading aloud to continue. For boys of all ages asked, a total of 26% said that they wanted reading aloud to continue. An open ended question from a 16 year old boy from Ontario on why he enjoyed being read to: "It was so much fun to be read to. I loved the bond that Mommy and I had." Parents and kids agree: they love read aloud time. 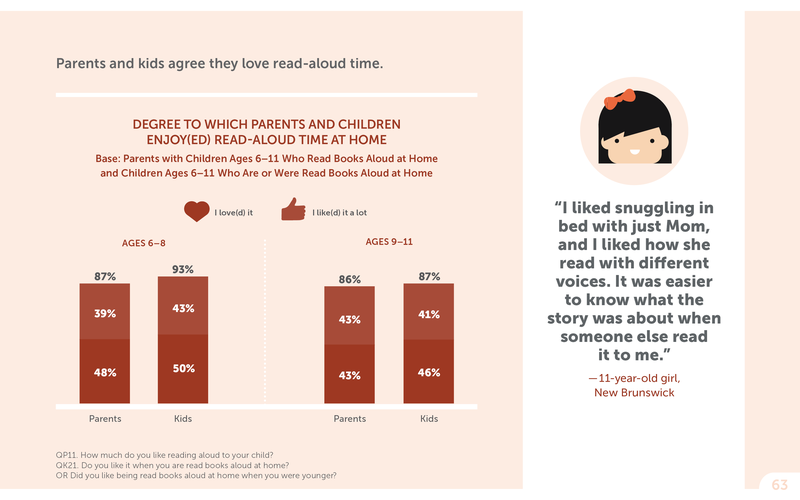 A base of parents with children ages 6-11 who read books aloud at home, as well as children of ages 6-11 who are or were read to aloud at home were asked how much they enjoyed reading to their child/being read to by their parents, respectively. For parents of kids ages 6-8, 48% said that they loved it, and 39% said that they liked it a lot, yielding a total of 87% that expressed great enjoyment towards the activity. For kids ages 6-8 themselves, 50% said that they loved it, and 43% said that they liked it a lot, yielding a total of 93% that expressed great enjoyment towards the activity. For parents of kids ages 9-11, 43% said that they loved it, and 43% said that they liked it a lot, yielding a total of 86% that expressed great enjoyment towards the activity. For kids ages 9-11 themselves, 46% said that they loved it, and 41% said that they liked it a lot, yielding a total of 87% that expressed great enjoyment towards the activity. An open ended response from an 11 year old girl from New Brunswick on reading aloud: "I liked snuggling in bed with just mom, and I liked how she read with different voices. It was easier to know what the story was about when someone else read it to me." The top reasons parents and children ages 6-11 say they like reading aloud together are that it is a special time with each other and that it's fun. A base of parents with children ages 6-11 who read books aloud at home, as well as children of ages 6-11 who are or were read to aloud at home and like(d) or love(d) it were asked for which reasons they enjoyed reading to their child/ being read to by their parents. 71% of parents agreed that they enjoy(ed)reading to their kids because it is/was a special time with their child. 67% of parents agreed that they enjoy(ed) reading to their kids because it creates/created a love of reading. 66% of parents agreed that they enjoy(ed) reading to their kids because reading together is/was fun. 61% of parents agreed that they enjoy(ed) reading to their kids because reading together is/was a relaxing bedtime routine. 54% of parents agreed that they enjoy(ed) reading to their kids because they get/got to talk about reading books together. 52% of parents agreed that they enjoy(ed) reading to their kids because their child gets/got to hear books that might be too hard to read on his/her own. 45% of parents agreed that they enjoy(ed) reading to their kids because they like/liked their child's reaction to the different voices they use/used while reading. 69% of kids agreed that they enjoy(ed)being read to by their parents because it is/was a special time with the parent. 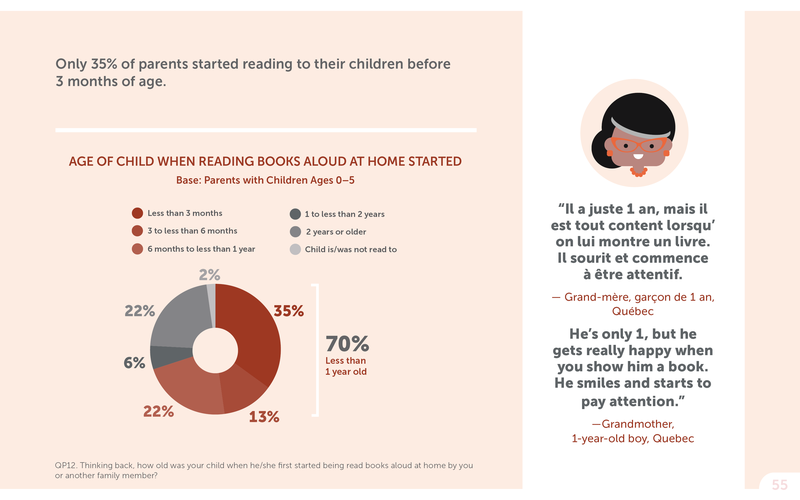 55% of kids agreed that they enjoy(ed) being read to by their parents because it is/was fun. 42% of kids agreed that they enjoy(ed) being read to by their parents because they get/got to listen to books that might be too hard for them to read on their own. 41% of kids agreed that they enjoy(ed) being read to by their parents because reading together is/was a relaxing bedtime routine. 38% of kids agreed that they enjoy(ed) being read to by their parents because it makes/made them really love reading. 33% of kids agreed that they enjoy(ed) being read to by their parents because they like/liked to hear the different voices the person reading to them uses/used. 32% of kids agreed that they enjoy(ed) being read to by their parents because they get/got to talk about the books with the person reading to them. 31% of kids agreed that they enjoy(ed) being read to by their parents because they like/liked not having to read by themselves. An open ended response from a 7 year old girl from Quebec on reading aloud: "It lets me spend time with mommy." Books Canadian Children most often are/were read aloud over and over again.